The Creative Independent (which former Pitchfork editor Brandon Stosuy is the editor in chief of) is throwing a showcase with a solo set by Julia Holter, plus Georgia, and a live conversation between Tunisian protest singer Emel Mathlouthli, Downtown Boys’ Victoria Ruiz, and writer Amy Rose Spiegel. It goes down on June 10 at a TBA venue. In addition to the Sacred Bones 10th anniversary showcase happening during Red Bull Music Academy, there’s a Sacred Bones 10th anniversary Northside showcase too. This one happens on June 10 at Brooklyn Bazaar with psychedelic punk masters Destruction Unit (who we just caught in LA), plus Institute, Pop. 1280, Cheena, The Hunt, and more TBA. The 33 1/3 book series is doing a cover-sets showcase again on June 10 at Rough Trade with Lower Dens (performing songs from ABBA’s Gold: Greatest hits) and Tredici Bacci (performing songs from Dusty Springfield’s Dusty in Memphis). Le Poisson Rouge is presenting a showcase with a collaborative set from Suicide’s Martin Rev and producer Craig Leon (who did the first Suicide album and several other classic punk albums), plus post-punk vets Bush Tetras, and no wave legend Lydia Lunch is your emcee for the evening. That happens at The Hall at MP on June 9 (tickets on sale 4/14 at noon). Orange Milk Records has a showcase on June 10 at Cape House with Foodman, Kate NV, Giant Claw, Seth Graham, Machine Girl, Maharadja Sweets, G.S. Sultan and Honnda. Tickets for individual shows are on sale (or will be on sale soon) HERE. You can also buy a Northside badge, which gets you into any show (based on capacity). 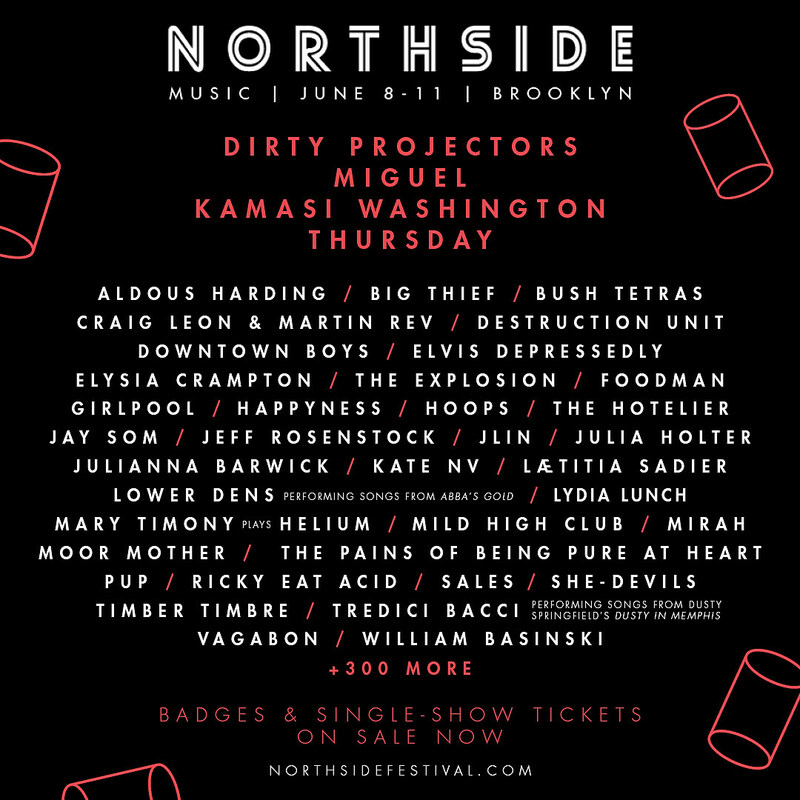 Previously-announced Northside shows include Dirty Projectors/Kamasi Washington/Jay Som, Thursday/PUP/The Hotelier/Jeff Rosenstock, Miguel, Mary Timony Plays Helium, Big Thief, and more.